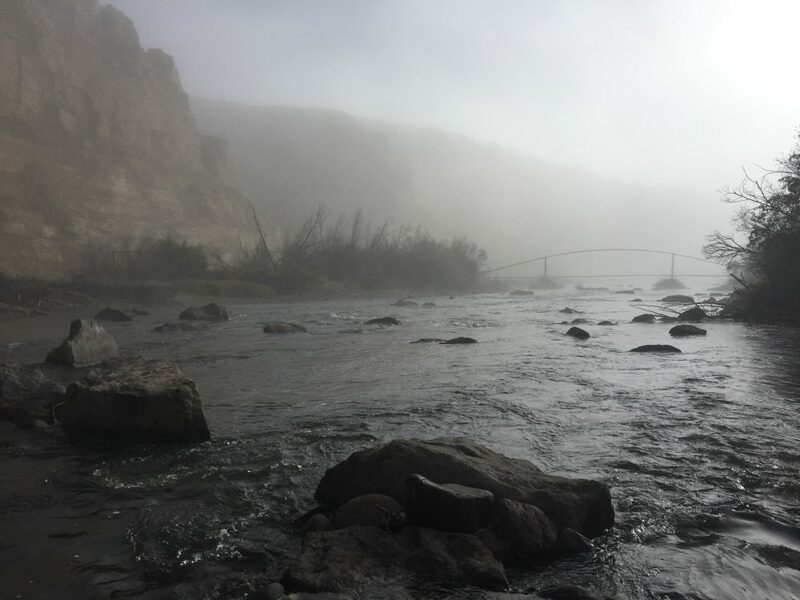 The Rio Grande pours out of the Box Canyon (See my Day 2 fishing article.) 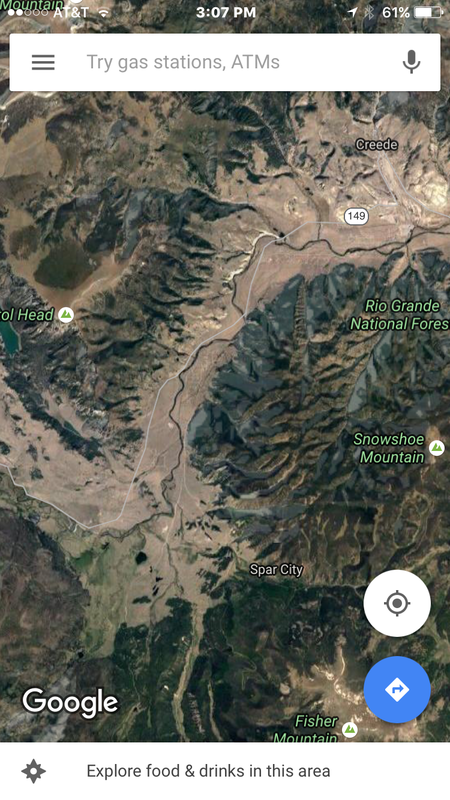 below Rio Grande Reservoir into a broad open valley, then flows for miles, undulating its way towards Creede. From there it picks up speed and hustles past the scenic Palisades on the way to the little burg of South Fork. In between it grows some big trout and in good numbers—enough to warrant Gold Medal water status from the state. The challenge? Lots of it flows through private land, but with a little sleuthing you can find plenty of good water that doesn’t get pounded too hard. When I last visited the area as a teenager, the Rio Grande valley up high was just some big ranches and wide open range. Now there’s lots of cabin sprawl, and the story is being written again of how the West was lost. 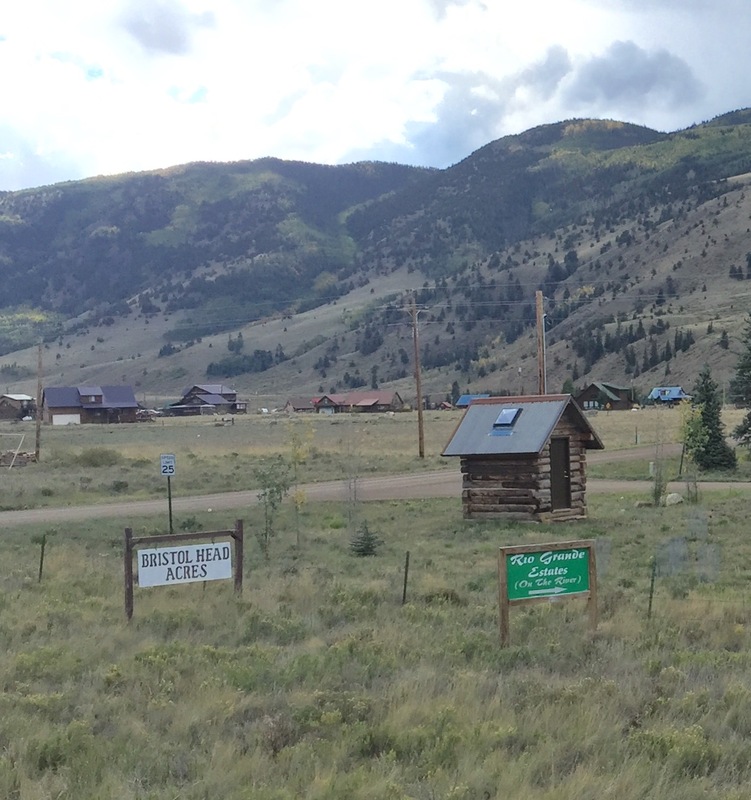 We have had mining, logging, overgrazing…and now the most pernicious long-term threat to the landscape and environment is scattershot second home development, often plunked down in the meadows where elk, deer, and other critters roamed. Habitat fragmentation as wildlife biologists would say. As that great ecologist Aldo Leopold wrote of another time and place, “We are rearranging the Alhambra with a steam shovel, and we are proud of our yardage.” Ah, but that’s a story and diatribe for another day. Thank the stars for public land! I have my eye on three stretches of water that look to hold some hefty fish: A long winding three-mile section above Marshall Campground (about 8 miles west of Creede on Highway 149), public water a few miles below at the Antlers Lodge, and the Coller State Wildlife Area between Creede and South Fork. I find the keys in all three areas to be to (1) look for water that requires a bit of a hike or (2) to wade across the river and fish the side where the anglers’ path is fainter. 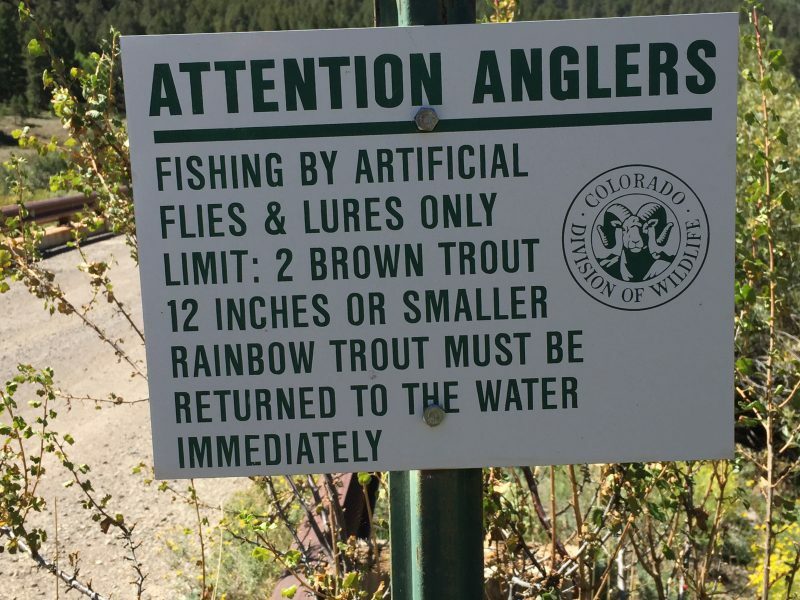 Throughout this area, be sure to pay heed to the special regulations that have helped keep this such a terrific fishery. This time of year, there are scads of mayfly and golden stonefly nymphs in the water, so that’s a good indication of flies to use. 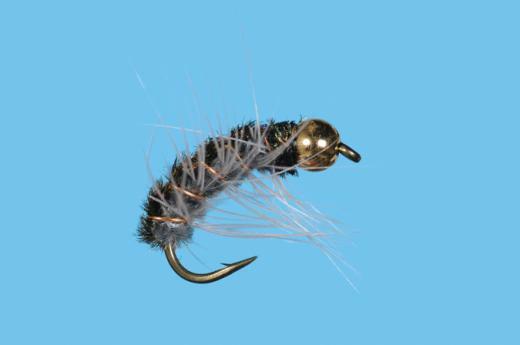 I choose a #16 Tung Teaser, that doubles as both a mayfly and small stonefly imitation. 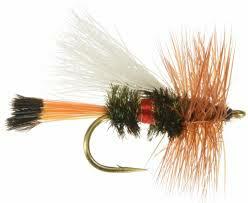 There’s grasshopper still around, so my dry is a yellow #14 Stimulator or #16 Royal Coachman Trude. 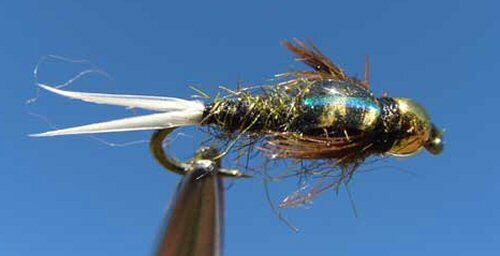 Other good nymphs are my old reliable green hotwire CDC caddis and a silver Copper John, both in #16 and #18. This time of year the Rio Grande is flowing a very wadeable 280 cfs at Wagon Wheel Gap (Check the Colorado Water Talk website. ), and the water is a beautiful clear green color. A 5X leader on a five-weight fly rod is ideal—there are some very substantial browns and rainbows plying these waters and puny sticks are simply no match for them in the big current. I find the browns in the usual spots: Up against the banks in tricky lies around logs and snags, quieter plunge pools just below rapids, and off to the side of foamy currents in just enough water to give them cover. 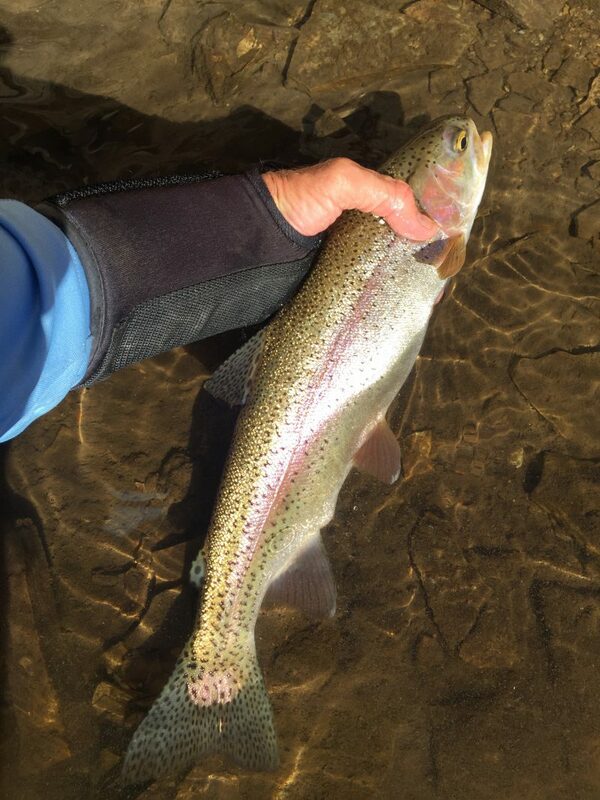 Rainbows seem more eclectic in their choice of hiding places—I catch them in fast runs, but also in slow back eddies up against cliffs. On a big river like the Rio Grande, it helps to size up each pool or run, breaking it up into bite size chunks before plunging in and casting blindly. A wading staff helps as do felt soles. I find the new high-tech, so-called sticky rubber soles are just that…so-called. 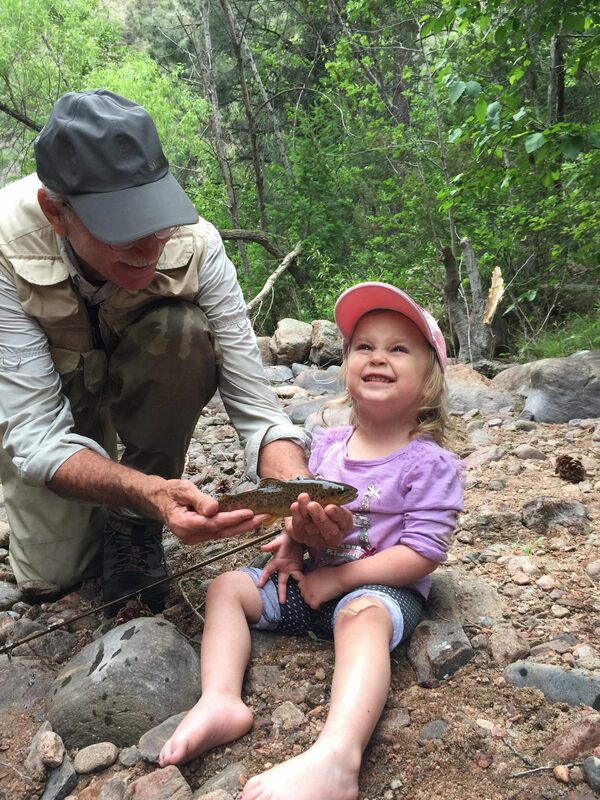 After some bone-rattling four-wheel drive expeditions and some vigorous hikes to remote sections of the river earlier in the week, fishing the lower Rio Grande around Creede is duck soup. A quarter of a mile walk and maybe a little scramble down a slope to the river is all that’s required. 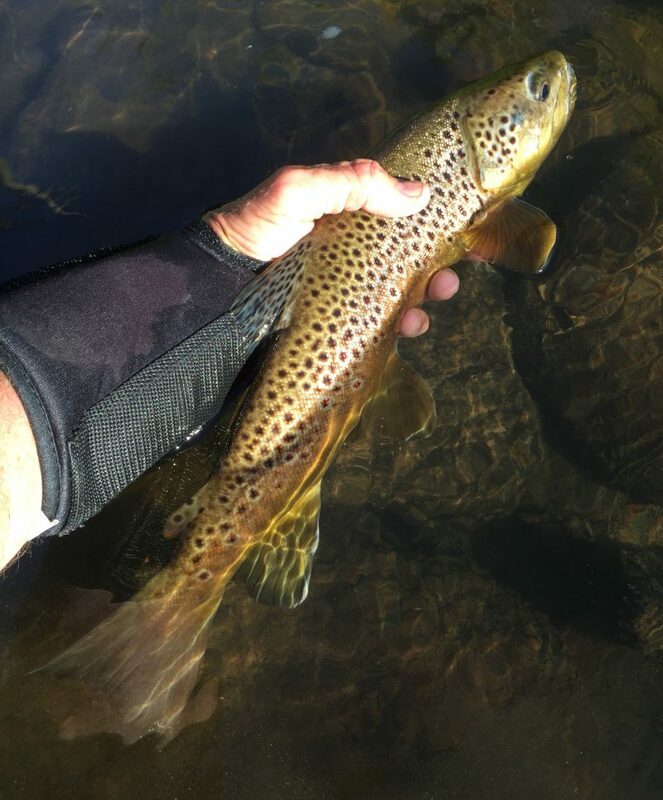 And the rewards are substantial—I manage to land a sleek 17-inch brownie and a muscular 18-inch rainbow on two different sections, one on the Trude and the other on the Tung Teaser, along with scores of brownies from 10-15 inches. Now it’s back to the Antler’s Lodge where my mobile fish camp is ensconced in the lodge’s excellent RV park, a quick shower, and over for a gourmet dinner at the lodge’s excellent restaurant overlooking the river. Something to be said occasionally for the perquisites of civilization. of fishing the mighty and pristine Rio Grande deep in a gorge just outside of Taos keeps me in a good frame of mind—the river looked positively entrancing as I pass over it on the Rio Grande Gorge Bridge on the way into Taos. I set up my mobile fishing camp in the surprisingly quiet and bucolic Taos Valley RV Park, only 10 minutes from the downtown plaza, then head to the Taos Fly Shop just down the road, fly fishing central in this part of New Mexico. The affable owner, Nick Streit, gives me a friendly welcome and shares the skinny on what flies are hot. 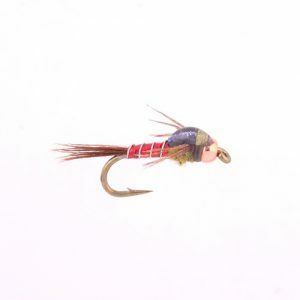 He recommends a double nymph rig—his local pattern called a Poundmeister in Size 6 (tied to represent a crane fly larvae) and a Size 18 red micro mayfly—both dangled below a big dry to serve mainly as a strike indicator, although Nick notes that there is still some hopper activity in the gorge so I might get surprised. 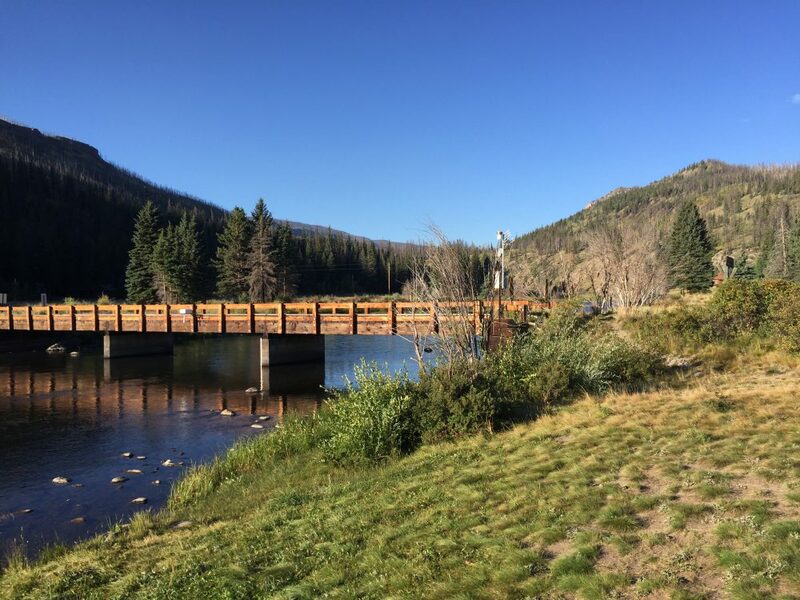 From the Colorado border to below Taos, there are over 30 miles of good water to choose from on the Rio Grande. Where to go?? I tell Nick I am looking for some solitude as well as hungry fish and mention that I read some scuttlebutt online that a stretch of the river in the canyon reached via the Miners Trail is a good candidate (some guide books call it the Cedar Springs trail, but the Cedar Springs are on the other side of the river and there is no trail from there to the river). 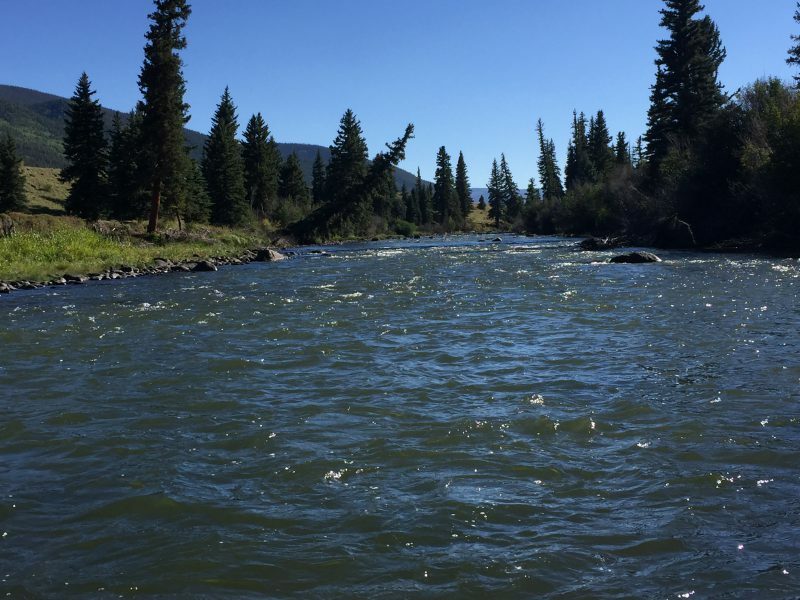 Nick recalls his guides saying it’s been a little off lately, but I would probably have it to myself because of the steep hike in…but if I go, for the best fishing be sure to hike downstream a piece from where the trail intersects the river. That will prove to be excellent advice. I get a dozen of the various fly patterns he suggests, a copy of his father Taylor’s excellent book on New Mexico fishing, my license and with a few hours of daylight left, decide to scout out the Miners Trailhead. Glad I did.The route to the trailhead is circuitous. From downtown Taos, I follow directions I find online in an article in the local paperabout hiking the Miners Trail. I take Highway 522 north turning off left (west) on B-006, a good gravel road just before you get to the hamlet of Arroyo Hondo. This takes me west down to the John Dunn Bridge across the Rio Grande. The climb out of the gorge from the bridge is a rough road with tight switchbacks. When I hit the rim, I drive another mile or so until I see a sign on the right indicating the Colorado State Line is 34 miles to the north, turn there and proceed about another 1.5 miles till the road forks just beyond the last house. The fork to the right is TP (Taos Plateau) 219, but the sign has been torn off the post. Keeping the faith, I turn and in a half mile or so I see a sign that has survived the vandals. From the fork it is about 2.5 miles to the trailhead. The road becomes progressively rougher and heavily rutted in spots—I wouldn’t want to navigate it when muddy. A high-clearance vehicle can make the trip, but leave the family car at home. My Xterra SUV has no problem, but after hitting a couple of deep potholes that rattle my teeth, I slow to a steady 10 mph. The sun is setting as I find the trailhead and peer down into the canyon. It’s a fairly short, if steep trail, only a little over a mile one-way. The trail is rocky but decently maintained, so I make a decision to hike in the next day wearing my waders and fishing vest. Then I head back to my trailer to rig up and get an early start. 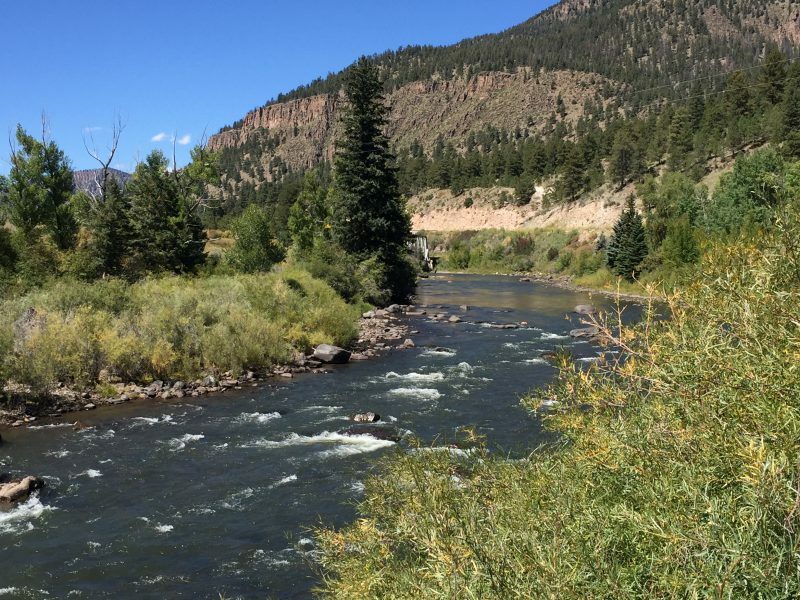 In the mid-1960s I caught my first trout on a fly near Creede, Colorado, just below Thirty Mile campground–on a stretch of the Rio Grande known as the Box Canyon. The name Box Canyon intrigued me then and so it did again 50 years later as I scanned the map looking for a stretch of the river where I could find some solitude….and big fish! 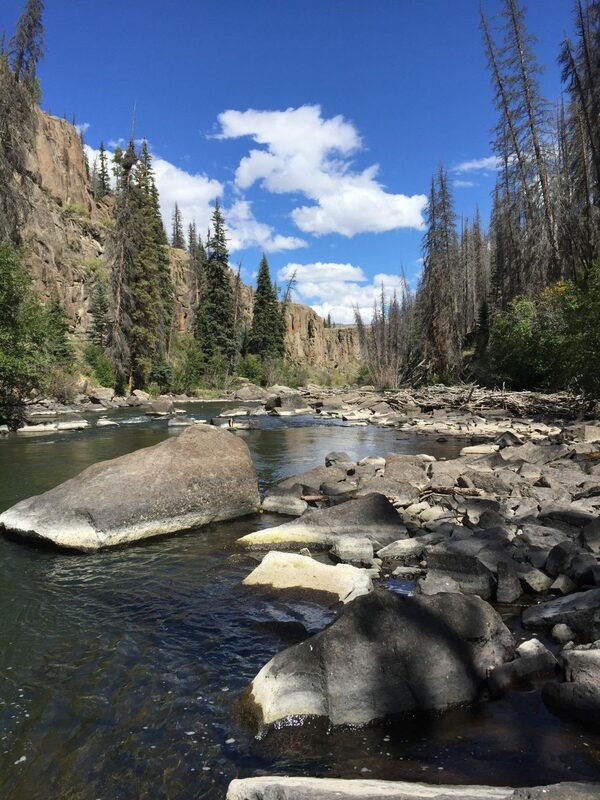 The Box Canyon is a five-mile long section about 20 miles above Creede that is pristine and relatively untouched, primarily because the river veers away from Forest Service Road 520 that provides access to the upper Rio Grande River. I was champing at the bit to revisit this water, but this time wanted to probe deeper into this wild area where hefty trout reputedly hide. I find there are two ways to venture into the canyon–either hike down from Thirty Mile/River Hill Campgrounds or up from below, starting at the Texas Creek Trailhead near the San Juan Ranch. I would find both are worth the hike!